There are so many baseball players affected by the yips (even though you may feel that you are the only one who can’t consistently make accurate throws). Can you relate to the following experience? In LSU’s Game One match up against TCU at the 2015 College World Series, LSU pitcher Jared Poche inexplicably had difficulty throwing to first on two routine grounders. Poche retired the first nine batters he faced before his two errors eventually leading to poor command of his pitches. Poche’s two throwing errors were out of character since he previously only made two errors all season. After the game, LSU head coach Paul Mainieri talked about how the yips and the mental aspect. On his first yipped throw, Poche fielder a grounder and attempted to soft toss the ball to the first baseman but instead lobbed the ball well over his teammate’s head. The very next batter sent a comebacker to Poche who yipped again pulling the first baseman off the bag for his second throwing error. Poche’s teammate and fellow starting pitcher Preston Morrison was shocked by Poche’s errant throws because of the amount of repetitions the pitcher take in practice. So if you want to get over the yips, you need to get over the fact that the yips are mostly mental. It is that mental component that causes you to jerk or twitch as you are in the middle of your throwing motion. The yips are a product of a mental inference that got in the way of you making an effective throw. If you can re-tune your focus, you can get rid of that mental static that causes errant throws. You need to understand that the yips are a blip in your thinking. Instead of fielding and just throwing, you field the ball and think about the throw while you are throwing the ball. Basically, you are trying to throw the ball instead of relying on your natural ability to throw. Understand that your throw does not need to be perfect. You don’t need to throw it perfectly in the glove… there is an acceptance zone that will allow your teammate to field the ball. Concentrate on the natural pace of your throw. You throw should be quick with some pace instead of hesitant and deliberate. Focus on the pace of your throw instead of guiding the ball to the target. The yips are beatable if you take the right mental approach. Inability to throw or pitch freely (despite the fact that you can in practice)? Anxiety, tension and over control of their action? Performance anxiety about what others will think? Super low confidence with the yips-infected mechanics? Feeling like an alien has taken over your body and you have no control? If you can throw well when alone, but can’t take it to games, this is a mental game issue and not a physical challenge! “Breaking The Yips Cycle” is a complete brain dump of the TOP Eight mental training sessions I do with my personal coaching students to help them overcome the yips and play with freedom again. Two CDs (CD purchase only). 120 minutes of mental training sessions to help you gain greater freedom, focus on the right performance cues, and simplify your prepitch routines. MP3 Audio (Digital Download). 120 minutes of mental training sessions you can download to your computer right away while you wait for the CDs and workbook to arrive. (MP3 Audio value = $149). 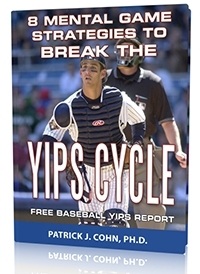 An 8-Session Breaking The Yips Cycle Workbook to guide you through my mental game sessions and to overcome the throwing yips (Workbook value: $149.00). Bonus Session: Practice drills to free up your throwing to help you improve consistency and stop focusing on mechanics when you play. Do you throw accurately in practice, but lose control in games? Learn how to over come the throwing yips! 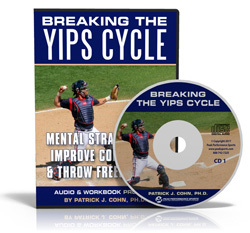 Download our FREE Throwing Yips Report and learn how to break the yips cycle and throw freely and confidently again! What are ball players and coaches saying? Beat The Throwing Yips With Expert Mental Game Coaching! ~Rick Hall, Baseball Coach, Daytona Beach C.C. To rebuild your confidence, you must begin to throw freely and not over control. The over control is often about worrying about what others think about your game. Is Missing Throws a Mental or Physical Problem? 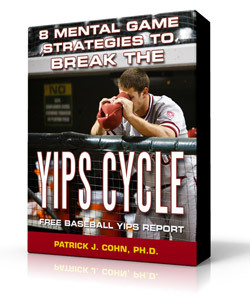 Dr. Patrick Cohn is a master mental game coach who has helped baseball players and golfers overcome the yips cycle for over 10 years. In addition, he's work with top athletes in the world for more than 25 years.